There are a plethora of popular home remodeling ideas you should consider before embarking on a major home remodeling project. Popular home remodeling ideas range from small painting projects to building home additions and everything in between. If your family is growing and you want to stay in the same neighborhood then building a home addition may be the right home remodeling idea for you. Home additions could include a family room or master bedroom suite. On the other hand, if you are on a tight budget then small home remodeling ideas such as painting or renovating a bathroom may be the ticket. Before jumping into a home renovation project take a look at some of these popular home remodeling ideas below. Each home remodeling idea its own pros and cons, and what is right for you and your family depends upon your specific needs and requirements. Remodeling a kitchen is an excellent way to modernize your kitchen and achieve a high rate of return. Today’s savvy home buyer always ranks a kitchen high on their must have list. So if a kitchen remodeling project is in the cards for you, make sure you do not skimp. Granite countertops, stainless steel appliances, workspace lighting, and ceramic tile floors are all popular and highly sought after kitchen remodeling features. A family room or great room addition is an excellent way to create a large common area for the family to gather and relax. Typically a family room addition should be situated near the kitchen so that guests can be in visual contact with you while you are preparing meals. Popular home remodeling ideas home-buyers like to see in a family room addition, are large rooms, extensive use of natural lighting, and vaulted ceilings. In addition, make sure you have all the necessary outlets to support the latest in home theater technology. If you have an older home, chances are your bathroom is outdated and has a used look. Remodeling a bathroom is a very popular home remodeling idea as it provides a lot of bang for the buck, both in terms of your own utilization and return on investment. When planning a full bathroom home remodeling project make sure it includes the installation of a jet bathtub and/or a ceramic tile shower stall. Also make sure you update the bathroom vanity and countertop, as well as the flooring material. Ceramic tile floors are highly sought after by homebuyers so you may want to skip the Linoleum on a new bathroom remodeling project. If your home has an unfinished basement then a basement remodeling project may be the perfect home remodeling idea for your family. A basement remodeling project can provide a significant amount of new living space and can include recreation rooms, bedrooms, bathrooms, and even a bar area. Basement remodeling projects are also very cost effective compared to a home addition as no outside work, such as excavation or framing is required. 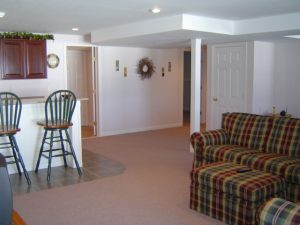 When considering a basement remodeling project, there a number of popular home remodeling ideas you should consider. Key concerns in a basement remodeling project include, basement water sealing, hiding ductwork, providing access to upper level plumbing, ceiling types, and lighting. Make sure you consider all of these items prior to jumping into a basement home remodeling project..
An attic conversion project is another home remodeling idea to gain addition living space within the home. Popular home remodeling ideas that must be considered when contemplating an attic conversion include: the installation of a staircase, the addition of dormers, insulation, and sistering additional framing lumber to the ceiling joists of the lower level. Adding a garage addition onto your house is an excellent home remodeling idea. A garage provides not only storage space for your vehicles, but also for many other items including bikes, lawnmowers, and other yard and garden tools. In addition, if the garage addition is designed correctly a finished room may also be created in its attic area. No matter what home remodeling ideas you are considering, be it a simple home remodeling project or building a large home addition onto your home, planning is critical. This includes the development of architectural plans in the case of a home addition, to a kitchen cabinet layout design for a kitchen home remodeling project. By planning properly you can obtain accurate home remodeling costs and a timeline for completing your home remodeling ideas and plans. For more help on realizing your home remodeling ideas or building a home addition, see HomeAdditionPlus.com’s Home Addition Bid Sheets. Our Home Addition Bid Sheets provide you with the knowledge and information on how to plan a home addition project, and what to look for when hiring home remodeling contractors. They also include detailed cost breakdown tables and spreadsheets for estimating your own new home addition building costs.